Rubber bands can be used in a number of versatile ways around the kitchen to make everyday chores easier. Keeping these 16 rubber band tricks in mind can help you avoid common kitchen mishaps. Every now and again, people run into a bottle or jar who’s top just won't budge. The remedy is simple...Wrap a rubber around the top a few times, then give it another try. Chances are it’ll come loose immediately. Also works for gripping water bottles, baby bottles and sippy cups. Using rubber bands or the Rubber Slip-On Grip makes opening your stubborn jars easy! If apple wedges sit out for too long, they inevitably turn brown. To keep them looking delicious, put the apple wedges back together using a rubber band to hold it in place. It’s the perfect solution for a child’s lunchbox, or for preparing a fruit dish in advance. For leaky plumbing under the kitchen sink, simply wrap a rubber band at the source of the leak for an effective temporary fix. Larger rubber band sizes can be used for more serious leaks. Wrap each wine glass with a different colored rubber band to identify which glass belongs to who at a dinner party or get-together. Always grab the right glass, no matter how many bottles are shared. Rubber bands can also be used to create amazing DIY wine glass designs: Learn More. Keep flowers arranged in a vase by using a rubber band to bunch the flower heads together. For the best results, cut the stems right above the height of the vase then simply wrap a rubber band or two around them. Learn about flower rubber banding at Martha Stewart. Create patterned Easter Eggs by wrapping any number of rubber bands around eggs before dunking them in the dye. Both Kids and Easter Bunny will love these striped eggs. Watch Modern Mom demonstrate how easy it's done: Rubber Band Easter Eggs Video. The kitchen is filled with foods stored in non-sealable bags including potato chips, breakfast cereal, rice, and more. Keep these products fresh by wrapping rubber bands around their openings, making them air-tight. 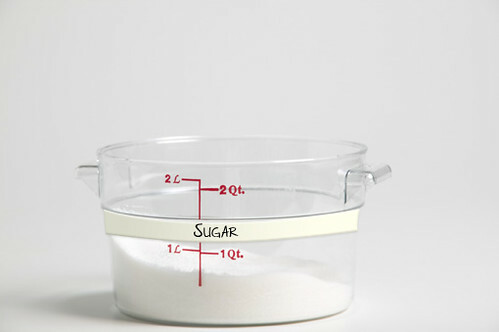 For household cleaners and other liquids found in the kitchen, keep track of the amount of product left in each container by marking the level with rubber bands. Drinking glasses can slip through young fingers more times than a parent can count. It happens to the elderly and those with Carpal Tunnel Syndrome too. All that shattered glass can be avoided by simply wrapping a rubber band around the glass. Large rubber bands are perfect to hold trash bags in place and eliminate them from slipping into the can. Can Bandz let you to stuff your can without worrying about the liner falling down and spilling your trash. Rubber Bands seem to have never ending applications, more are being discovered all the time. If you'd like to share your clever rubber band tricks, please contact us!